Planting a garden bed without tilling is a cornerstone of our organic garden philosophy to take care of the soil, disturb it as little as possible, and use a layering system to keep our garden beds nearly weed-free throughout the gardening season – honest! One of my goals in creating and continuing to write An Oregon Cottage is to empower you to do the things you’ve always wanted to do – the simple back-to-the-earth type activities that connect us to the land and those around us. 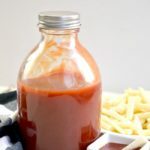 Making your own salad dressings or ketchup is one of them, as is giving thoughtful handmade gifts. 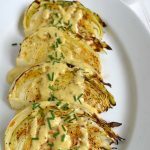 But growing your own food – and then simply preparing it – is one of the things I wish I could just sit down with each and every one of your and just say, “you can do it!” And you will LOVE it. And it doesn’t have to be hard. You do NOT have to spend hours weeding in the heat of the summer or look at your patch in despair wondering where the seedlings are in all those weeds. I promise. 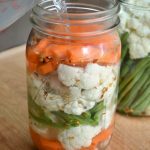 All you need to do is a bit of planning and take these steps I share below to enjoy a summer of simple maintenance (watering, harvesting, pulling an occasional weed) and lots of fresh produce. The secret? Do not ever use a tiller on your soil. And if you have, then stop asap. 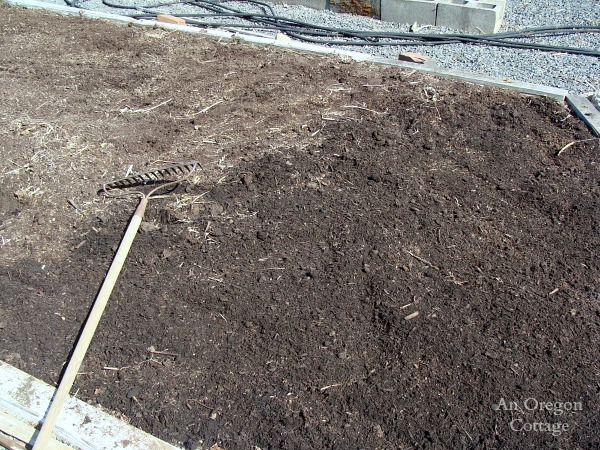 There are a number of reasons not to till garden soil which I detailed in this article about designing a garden for easy care, but for our purposes here this is the main thing: tilling brings up all the weed seeds, exposing them to light and air everywhere. Some weeds seeds can lay dormant for years and years (some say up to 1000!) and not disturbing the soil keeps them right where they were where you don’t have to deal with them. Here is what one of our 4 larger vegetable beds typically looks like in February or early March – which is also typical for most yards and gardens. The traditional way of dealing with all these weeds that grow in the winter is to till with a machine and rake, but like I mentioned, you don’t want to till the ground for a variety of reasons. Cover with Plastic. Instead, in January, February or early March (or even in the fall after harvest if you’re really on the ball), throw a piece of black plastic over the bed (you’ll want a thicker plastic like this 6 ml roll) Then let time, sun, and heat do their magic. Remove Dead Debris. 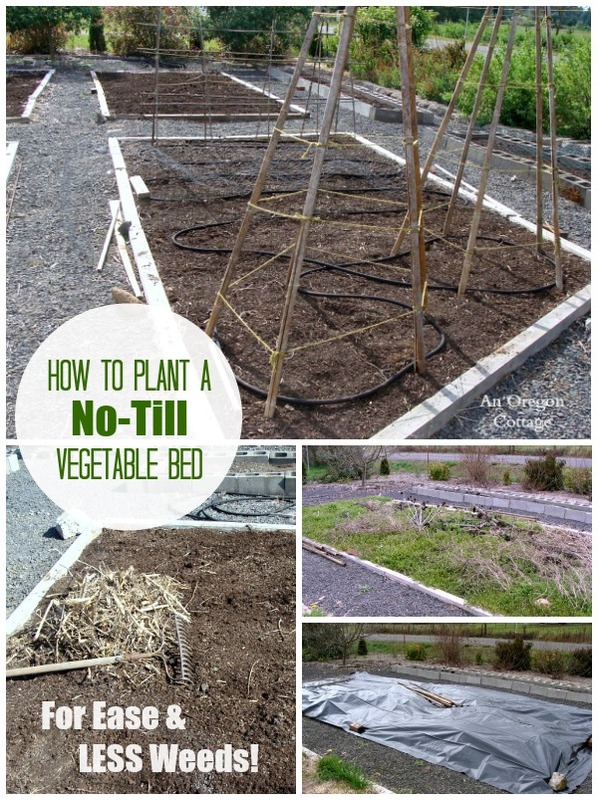 When it’s time to plant, pull back the plastic on your beds to reveal a bed of brown, dead debris. 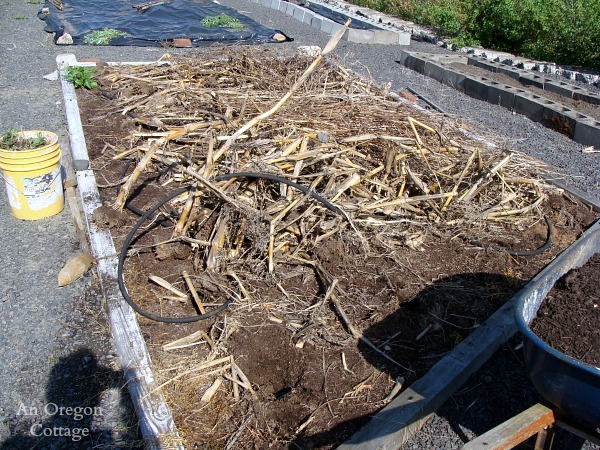 This bed shown above grew corn the year before and you can see I just threw the plastic over the dead corn stalks. I find them much easier to remove after a few months under the plastic. Haul away any large debris (pull the soaker hose if you have them) and start raking all the dead weed debris. There may be a few (very few) pernicious weeds like dandelion and thistle that you should dig by hand. I haven’t timed it, but it doesn’t take very long to take care of this, maybe 15-20 minutes on these beds which are about 9′ x 20.’ I think that may be less time than tilling with a machine! 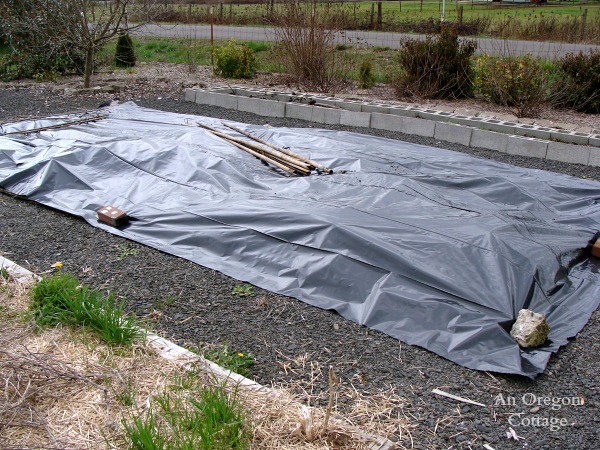 Layer on 1/2 to 1 inch of Garden Compost. 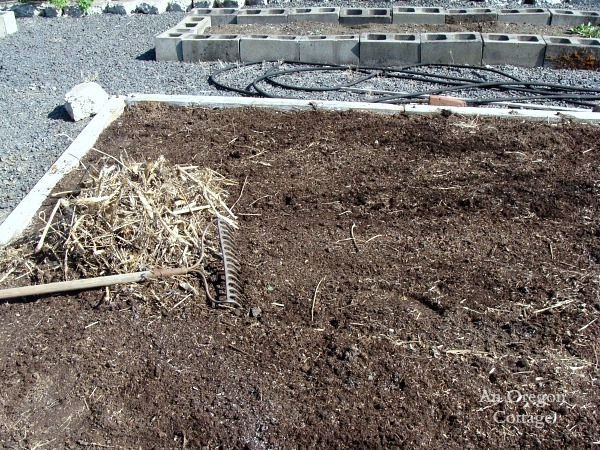 Add a fresh layer of compost to the bed and rake it smooth. It ends up being about 1/2″ layer, though in the first years as I was establishing the beds I added more – about 1 full inch. Do this every year to build the soil and just leave it on top. When you dig the furrows and holes for planting, it will get mixed in more. Wait, what? What about in the beginning? After a few weeks I planted beans, corn and potatoes (using the straw method and setting the tubers on top of the new soil) and by the time the roots needed more depth, the cardboard had softened and the roots grew as they needed. We had a great crop that first year, which actually surprised me. I thought the beds would need a year to really establish. The vegetables planted in the 10 years since have always done well. I use organic principals and make sure to rotate the crops so that the heavy-feeder corn usually follows the legumes (which fix nitrogen and enriches the soil). Doesn’t that sound easier than tilling all the grass for a new garden? Plant seeds and starts. After the bed is fully covered with compost, it’s time to plant. Lay soaker hoses or drip system for watering. Watering this way puts the water where we want it- not in the space between plants or paths where weeds want to grow- so it’s a major player in keeping weeding to a minimum. Overhead watering not only waters too much, it also isn’t as good for plants, encouraging mildew and diseases. 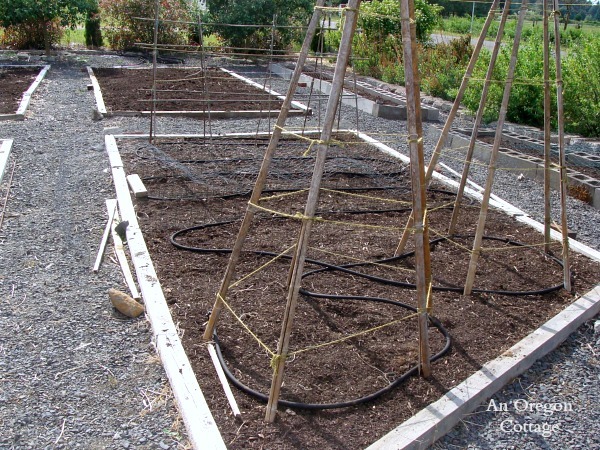 The bed pictured above is planted with beans (green and dry), cucumbers and squash, so I set up the trellises first, then laid the soaker hoses before planting the seeds (the chicken-wire fencing you see is to try and deter any birds that love looking for just planted seeds). The bed in the upper part of the picture has been prepared, too, to grow corn for this year. The technique is the same, though you can read more details on how to grow a weed-free corn patch here. 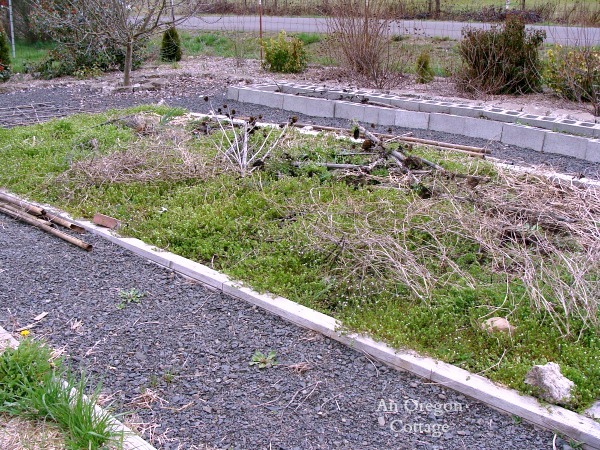 This is the part I want to encourage you with: when planting a garden bed this way I have very few weeds the entire remainder of the season. Honest! You’ll need to pull the occasional weed when you’re out in the garden harvesting and turn on the soaker/drip system every 5 days or so to water. That’s it – just enjoy your garden. 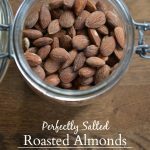 Please join my no-till world- I promise you’ll love it! Note: This was originally published in the first year of the blog, 2009, and has been updated with larger photos. Urgh. WEEDS, not “weeks”. *$#@ Autocorrect! Thank you! The retired teacher in me just can’t resist “grading papers”, I guess. Took advantage of last week’s warmth to begin my first experiment in minimal-till gardening by spreading a couple of cubic yards of compost … and now we’re expecting anywhere from 5″ to 18″ of snow. Oh well. Hi, Jami! Me again. 🙂 What size gravel do you have between your beds? And how do you manage kneeling on it? I typically am on my knees a lot. Of course, most of that time is weeding and if I do this right, I shouldn’t have to spend so much time on that, right? 🙂 Do you kneel when you plant? Do you use knee pads or some kind of pad? We are working on building the garden beds today…not getting the gravel yet, but I’m curious. Thanks so much! I hope I’m not asking a question that you’ve already answered, but I can’t seem to find this information. What kind of wood do you use for your beds? I noticed some of your beds are concrete blocks and some are wood. I have some blocks which I’ll use, but figured I’d use wood for other beds. I’m thinking we don’t want treated lumber due to chemicals leaching into soil. But does untreated rot quickly? Just wondering what you use. Thanks again! You’re right, Kenna, you don’t want to use treated wood. Cedar is the longest-lasting, though it is the priciest. Whatever wood you use, you will have to replace it in 10 years or so, so build your beds with that in mind (i.e., make the corners solid that then will be easy to remove/replace the sides). We’re facing this now, and we didn’t really build them with that in mind, so we almost need to start again. There are pros and cons to both wood and cement blocks, we’ve got some of both. Would feed bags work in the place of cardboard when you first begin the bed? We have chickens and a horse so end up with a good supply of feed bags. Thanks so much for your time to share your tips and techniques! They are brown sacks like a brown paper bag–just heavier. Good idea to try a small area first. Thanks. How do you make this work in the perennial beds, like asparagus and rhubarb? I just cleaned 2 beds after school and then came in to find this post! I maybe be re-thinking my next few afternoons! I use newspaper under the mulch in the rhubarb beds, similar to our flower beds, and when the asparagus patch was young, I did that too. But now there’s not as much room between the clumps as they grow, so I just pull what weeds are there and layer the compost. Mine are growing in a raised bed, though, so I only fill a bucket of weeds a couple times during the season. If you don’t have a permanent edge, I’d definitely use cardboard and mulch along the edges. Hope this helps lessen your workload! 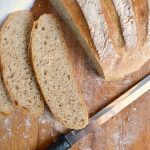 What a great and inspiring explanation of this technique! Thanks for sharing. I’ve got a huge planter that I hand tilled with a shovel and pitch fork last year. It had a previous owner who had not weeded in years! I’m definitely going to use the plastic technique this year instead! Awesome, Naomi – so glad to hear it will save you work! Hi, Jamie…what sizes are your beds, and how many do you have? We are moving back to our 10 acres soon, and the garden will need a lot of work. I’m actually in the process of planting berries around the perimeter….Gooseberries, Blackberries, Blueberries, and maybe some Logan berries and black raspberries. My garden spot is about a half acre square. Want to leave the middle open for beds, hence the berries on the perimeter. Wanting to find a permanent place for rhubarb and asparagus…going to be running out room for my veggies! Oh, and I’m seriously thinking about the newspapers and compost for the berries…love all the information you share! I have 6 4×20 raised beds and 4 9×20 moderately raised beds (just beds with permanent paths and edges), Sharon. These are all for veggies with beds on the sides for berries, currants, rhubarb, asparagus, etc. Your new gardens sound fabulous!! You have a very nice garden. 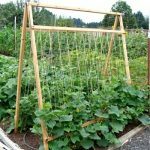 I thought I read something in your post about a trellis for squash – do your squash grow up? Our squash plants are taking over the back yard – not very happy with that. what a wonderful SHARE! I’m in love with the idea of having less weeds! I so wish I could pin to pinterest for my future reference! Ever thought of turning that on? Thank you for your advise!! I’m 7 months pregnant and about to, finally, START this years crops. Note… it’s June! 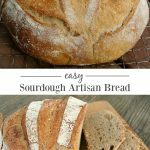 Going to be difficult anyhow, but I’m up for the challenge! Is there a certain kind/gauge of black plastic? 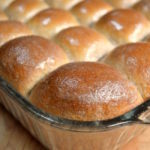 Do you buy it on roll? In the paint section of the hardware store? I love this idea! I’m all about less work when it comes to the garden! Not that I don’t enjoy gardening! I can’t think of a better way to spend time – but I can think of something better to do in the garden then weeding! Last year, for an experiment we tried leaving one of our garden plots untilled. We were only partly pleased with the result. I’m going to read some more of your posts and see if I can learn more! Hi, I jsut found your blog through Ann’s “make the best of things” blog. I’m glad I found you! I have begun changing over to a no till method of gardening as well. 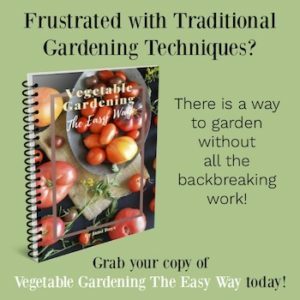 Have your heard of Lasanga Gardening? It is working well for me since you build up and we live on a pile of rocks! lol I have been blogging about my garden lately as it seems to be where I am spending alot of time! 😉 Please stop by if you have a minute. As for the deer, a slice or two of Irish Spring soap tied to a stake in a knee hi stocking has repelled them from my garden and we live in the woods! What is in the paths of your garden? Ah, the deer. Yes, we are putting up a tall fence, too. While they’ve not gotten all the beans, they have gotten way too many so our 4-ft fence is going to be replaces with a 7-footer. i like your bean poles. the deer got all of ours last year (our first year), but this year, we’re putting up a tall fence and hopefully we’ll have beans.